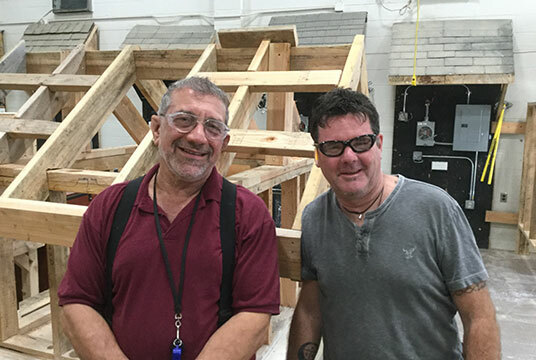 Tim Regan and Mark Levy teach the Green Building Trades Program at Bergen County Technical Schools in Paramus, New Jersey. Tim, a 12-year electrical instructor, and Mark, a 26-year plumbing teacher, seeing the value of a comprehensive green construction program to their students, combined their classes. The curriculum incorporates sustainability practices into construction, electrical design, HVAC, and masonry. Students are prepared for industry credentials in carpentry, plumbing, and electrical, among others. Tim and Mark connect their students to local industry experts, and students have put their skills to work building with Habitat for Humanity, including in the aftermath of Hurricane Sandy. Harbor Freight salutes Mark and Tim for their ingenuity and dedication in preparing their students for careers in this growing sector!